Heal Your Puzzle » Blog Archive » Is Your Life Hardwired? Are you Fed up with “That’s just the way it is”?! Is Your Life Hardwired? Are you Fed up with “That’s just the way it is”?! We are coming up to the end of 2015, the Festive Season will soon be upon us with all it’s frenetic sparkle! It is a Season where we generally socialise more and appreciate our friends and family for their part in our lives by sending cards and giving presents. For some of you it is a very spiritual time on an inner personal level too and maybe you feel closer to your Religion. For some of you however it is a very stressful time having to meet the expectations of such a Tradition-laden time… perhaps you would like to spend this time doing something else? Do you feel more anxious thinking about doing that?! Ever wondered why it’s so Hard to go against Tradition? 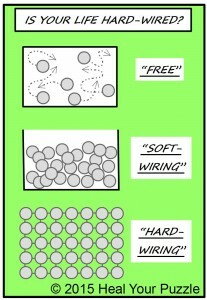 By definition, ‘Hardwiring’ is wiring that is fixed, constant and unchanging. In healing terms, this is exactly how it feels… no movement, not stuck but ‘quiet’… ‘That’s just the way it is’! It has been one of the most challenging forms for me to work with because it requires over-riding this overwhelming idea that it is untouchable and inaccessible; it actually has required a different approach to the ‘softwiring’.